The Edward M. Kennedy Institute for the United States Senate (also known as the EMK Institute) is a specialty museum and non-profit educational institution on Columbia Point in the Dorchester neighborhood of Boston, Massachusetts, next to the John F. Kennedy Presidential Library and Museum on the University of Massachusetts Boston campus. Named for U.S. Senator Edward M. "Ted" Kennedy, the Institute contains a full-scale reproduction of the United States Senate Chamber, a replica of Senator Kennedy’s Washington, D.C. office, and digital exhibits. The Institute is dedicated to educating the public about the important role of the Senate in the United States government, encouraging participatory democracy, invigorating civil discourse, and inspiring the next generation of citizens and leaders to engage in the civic life of their communities. This exhibit houses the only full-scale reproduction of the United States Senate Chamber. Visitors are encouraged to explore the space with the help of exhibit interpreters and participate in the Institute’s signature daily programs, such as Today’s Vote and Great Senate Debates. Today’s Vote ー During Today’s Vote, visitors have the chance to cast their vote on a rotating bill inspired by real legislation and related to the simultaneously changing Issue of the Day. Great Senate Debates ー Blending live performance with historic film footage and archival images, this twenty minute family program looks at the context and importance of crucial turning points in Senate history and reflects on their impact on our lives today. The exhibit halls feature technology-driven projected displays that immerse visitors in the history of the Senate through exhibits such as What is the Senate?, Traditions of the Senate, and People of the Senate. In addition, the halls include interactive exhibits, such as How a Bill Becomes a Law, where visitors work together to negotiate and select ice cream sundae toppings, vote on bills, override vetoes, and practice the skills needed to guide legislation through Congress. This exhibit features a full-scale replica of Senator Kennedy’s Washington, D.C. office, where visitors, equipped with provided tablets, are able to explore the stories behind pieces of the collection. The Institute offers a series of public programs and special events hosted in Boston and Washington, D.C. on local and national issues. These programs are open to the public. The Getting to the Point series convenes individuals with diverse perspectives to discuss current issues and the challenges our government is facing. Getting to the Point takes on various formats from town halls to keynote lectures and panel discussions, and showcases speakers from all walks of life. Since opening, the Institute has hosted a variety of speakers ranging from Senate Majority Leader Mitch McConnell, to Congressman John Lewis, to Red Sox Hall of Fame pitcher Pedro Martínez. This series brings together government leaders with disparate ideologies, from different political parties who are collaborating on a common cause. In moderated discussions, Across the Aisle highlights the type of civil discourse, negotiation, collaboration, and leadership that leads to solutions for pressing problems. The series features members of Congress, governors, mayors, and other elected officials and both national and local issues. The Edward M. Kennedy Oral History Project, created in partnership with the Miller Center of Public Affairs at the University of Virginia, was released in September, 2015. The project is a compilation of interviews from current and former members of the Senate, House, administration officials, foreign leaders, Senate staff, issue advocates, journalists, family, and friends documenting Senator Kennedy’s service. The Institute hosts a speaker series that draws on this resource to highlight current and future national issues before the U.S. Senate. The Senate Immersion Module (SIM) is a program for middle and high school students that uses negotiation and debate skills to teach about the legislative process. Using high-touch tablets provided by the Institute, groups of students work together to create a bill on a historic issue or a current policy. In the Future Senators program, visitors age 5–11 years old are introduced to an issue relevant to kids: whether the U.S. government should require a longer school day. The program features a segment from PBS’s Fetch! with Ruff Ruffman, includes “experts” for kids to interview, provides time for a debate about what participants learned, and concludes with a voice vote in the full-scale Senate Chamber. The Institute’s facility is a 68,000 square foot (6,317 m2) building designed by Rafael Viñoly, targeting Leadership in Energy and Environmental Design (LEED) specifications for sustainable building. The centerpiece of the Institute is a full-scale recreation of the Senate Chamber. The halls lining the Chamber are known as the Chamber Surround, and feature the majority of the Institute’s exhibits. The Institute also features a replica of Senator Kennedy’s Washington, D.C. office, a Special Exhibits gallery, an Orientation Theater, and three technologically equipped classrooms for educational programs and breakout sessions. The Institute also includes a café, a gift shop, and a coat check. 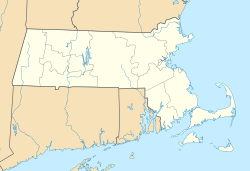 The Institute is located on Columbia Point in the Dorchester neighborhood of Boston, Massachusetts. The Institute is on the campus of the University of Massachusetts Boston, adjacent to the John F. Kennedy Presidential Library and Museum, and next door to the Massachusetts Archives and Commonwealth Museum. The Institute can be reached from nearby Interstate 93 or by taking the Red Line or the Commuter Rail to JFK/UMass station and boarding the free shuttle bus (#2) that drops off in front of the Institute. The Institute’s concept, design, and production are the result of a collaboration between Senator Edward M. Kennedy, his wife Vicki Reggie Kennedy, and Ed Schlossberg of ESI Design. During the production process, Control Group was brought on for software development, Richard Lewis Media Group for media elements, Electrosonic for projection technology, and Gigantic Mechanic for game mechanics. A groundbreaking ceremony was held on April 8, 2011. The Institute was dedicated by President Barack Obama on March 30, 2015, with Vice President Joe Biden and First Lady Michelle Obama in attendance. The Institute opened to the public on March 31, 2015. The cost of the museum was $78 million in 2011, with $38 million in federal funding and a $60 million endowment that helps to pay for the $10-12 million annual operating budget of the Institute. As of 2017, admission tickets cost $16 for adults with a $2 discount for Massachusetts residents. In 2017, The Boston Globe reported that ticket sales have been well below the expectations of 100,000 visitors per year, at around 15,000. The Institute is continually revising its business plans in an effort to increase sales, including through more bookings with tour companies and better marketing, but with no notable success to date. Budget cuts, coupled with hefty staff attrition, are used to reduce the operational budget and reduce dependence on endowment principal, the primary funding mechanism to date. The Institute’s current president, Mary K. Grant, Ph.D., assumed leadership in 2018. The Institute was previously led by Dr. Jean F. MacCormack from 2014 to 2017, Andrew Tarsy from 2012 to 2014, and Peter Meade from 2009 to 2012. ^ a b Levenson, Michael (2017-03-29). "Kennedy Institute finds if you build it, not everyone will come". The Boston Globe. Retrieved 2017-03-30. ^ Alspach, Kyle (2015-03-30). "President Obama in Boston: Leaders Should Be 'More Like Ted Kennedy'". BostInno. Retrieved 2016-07-01. ^ "Edward M. Kennedy Institute for the United States Senate: Explore the Institute: Exhibits: Chamber Programming". Edward M. Kennedy Institute for the United States Senate. Retrieved 2016-07-01. ^ Strong, Rebecca (2015-03-12). "A Look at the New Tech-Driven Edward Kennedy Senate Museum". BostInno. Retrieved 2016-07-01. ^ "Edward M. Kennedy Institute for the United States Senate: Explore the Institute: Exhibits". Edward M. Kennedy Institute for the United States Senate. Retrieved 2016-07-01. ^ "Edward M. Kennedy Institute for the United States Senate: Explore the Institute: Exhibits: How a Bill Becomes a Law". Edward M. Kennedy Institute for the United States Senate. Retrieved 2016-07-01. ^ Sobieraj Westfall, Sandra (2015-04-02). "Inside Peek: The Childhood Letters and Vintage Family Photos of Ted Kennedy's Collection". People. Retrieved 2016-07-01. ^ "Edward M. Kennedy Institute for the United States Senate: Explore the Institute: Public Events and Programming". Edward M. Kennedy Institute for the United States Senate. Retrieved 2016-07-01. ^ Krantz, Laura (2015-05-10). "Mitch McConnell praises Edward Kennedy in Boston". The Boston Globe. Boston. Retrieved 2016-07-01. ^ "John Lewis to Discuss Voting Rights at Kennedy Institute". Boston. Associated Press. 2015-07-19. Retrieved 2016-07-01. ^ "Pedro Martinez to speak at Edward M. Kennedy Institute" (Press release). Boston: Edward M. Kennedy Institute for the United States Senate. 2015-11-17. Retrieved 2016-07-01. ^ Clymer, Adam (2015-09-30). "Reflections of a 'Master Legislator'". The New York Times. Washington. Retrieved 2016-07-01. ^ Carswell, Simon (2016-05-17). "Ted Kennedy one of the 'great architects' of peace in the North". The Irish Times. Washington. Retrieved 2016-07-01. ^ "Inside Edward M. Kennedy Institute, Students Try To Make Senate Work". 2015-03-27. Retrieved 2016-07-01. ^ "US Green Building Council". Retrieved 2016-07-01. ^ Brownlee, John (2015-04-03). "In This Museum, You Don't Learn About Senators. You Are A Senator". Fast Company. Retrieved 2016-07-01. ^ Hohenadel, Kristin (2015-03-31). "The Ted Kennedy Institute Combines Cutting-Edge Tech With a Full-Scale Senate Chamber Replica". Slate. Retrieved 2016-07-01. ^ Leblanc, Steve (2011-04-08). "Kennedy Senate Institute in Boston Breaks Ground". Associated Press. Retrieved 2011-04-29. ^ "Former MCLA President Mary Grant to head Edward M. Kennedy Institute". The Berkshire Eagle. Retrieved 2018-02-08. ^ Gagne, Michael (2014-08-14). "Former UMD Chancellor Jean MacCormack named interim president of Edward M. Kennedy Institute". Herald News. Boston, Massachusetts. Retrieved 2016-07-01. ^ "EMK Institute Welcomes New President and Director of Programming and Education" (Press release). Boston, Massachusetts: Edward M. Kennedy Institute for the United States Senate. 2012-09-11. Retrieved 2016-07-01. ^ Forry, Bill (2009-07-14). "Peter Meade to lead new Kennedy Institute on US Senate". Dorchester Reporter. Boston, Massachusetts. Retrieved 2016-07-01. ^ "Historic Kennedy Home in Hyannis Port Gifted to the Edward M. Kennedy Institute for the U.S Senate" (Press release). Boston, Massachusetts: Edward M. Kennedy Institute for the United States Senate. 2012-01-30. Retrieved 2016-07-01.